Figure 1. Structure of apo-SH3BP5. (A) Domain organization of SH3BP5. (B) Superposition of apo-SH3BP5 structures from different crystal forms. (C) Structure of apo-SH3BP5. α1, α2, α3, and α4 are colored in dark blue, blue, cyan, and pale blue, respectively. (D) Hydrophobic interactions in the hinge regions. Figure S1. SH3BP5 (41–266)WT was partially degraded during purification. (A) Gel-filtration profile and SDS–PAGE analysis of SH3BP5 (41–266)WT. 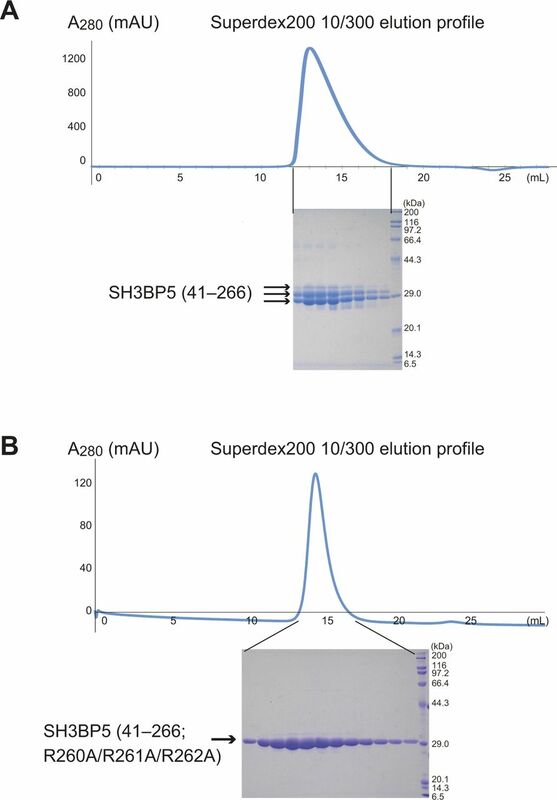 (B) Gel-filtration profile and SDS–PAGE analysis of SH3BP5 (41–266; R260A/R261A/R262A). Figure S2. Amino acid sequence alignment of SH3BP5 and SH3BP5-like proteins. Figure 2. Structure of the SH3BP5–Rab11a complex. (A) Overall view of the SH3BP5–Rab11a complex. Rab11a is colored in pink, except that switch I, switch II, interswitch, and P loop are colored in red, orange, grey, and yellow, respectively. SH3BP5 is colored in blue. The phosphate ion bound to the P loop is shown as light green sticks. (B) Structure of the GDP-bound Rab11a. The coloring scheme is the same as that in (A). GDP is shown as light green sticks. (C) Structure of the GTPγS-bound Rab11a. The coloring scheme is the same as that in (A). GTPγS and Mg2+ are shown as light green sticks and a purple sphere, respectively. Figure S3. 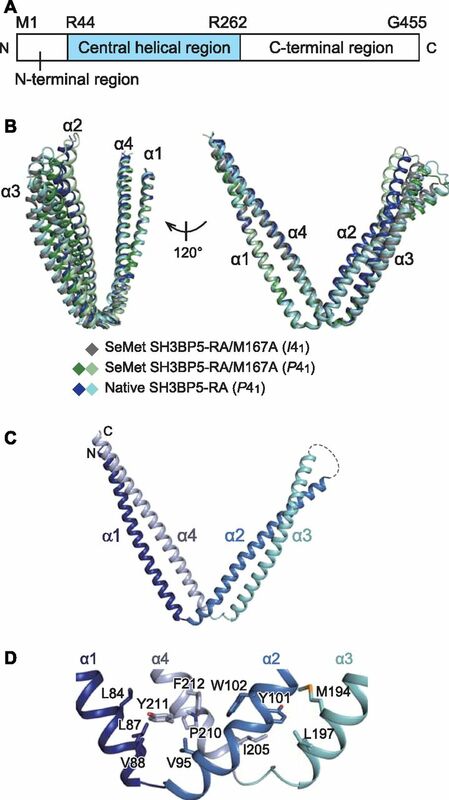 SH3BP5–Rab11a complexes in the asymmetric unit and the GEF activity of the α1/α4 coiled coil. (A) Four SH3BP5–Rab11a complexes in the asymmetric unit. (B) Superposition of the complex structures using Rab11a as the reference. The red circle shows the highly flexible edge of the α2/α3 coiled coil in SH3BP5. (C) GEF activities of SH3BP5-RA and the α1/α4 coiled coil containing R260A/R261A/R262A (α1/α4-RA) at indicated concentrations. The kobs values for the indicated conditions are shown in dot plots. The bars represent the average values. Figure S4. Semiquantification of GEF activities. (A) GEF activities for Rab11a (1–173) and Rab11a (1–211). The kobs values for the indicated conditions are shown in dot plots. The bars represent the average values. (B) GEF activities of the SH3BP5 mutants shown in Figs 3 and 4. The kobs values for the indicated SH3BP5 mutants are shown in dot plots. The bars represent the average values. (C) GEF activities for the Rab11a mutants shown in Figs 3 and 4. The kobs values for the indicated Rab11a mutants are shown in dot plots. The bars represent the average values. Figure 3. 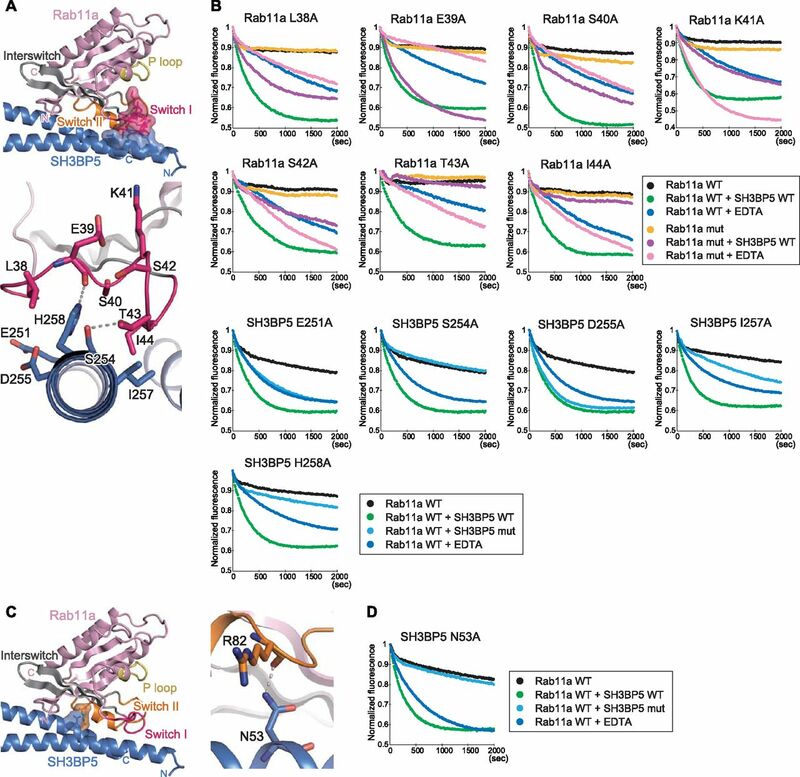 Interactions of SH3BP5 with the N-terminal region and interswitch of Rab11a. 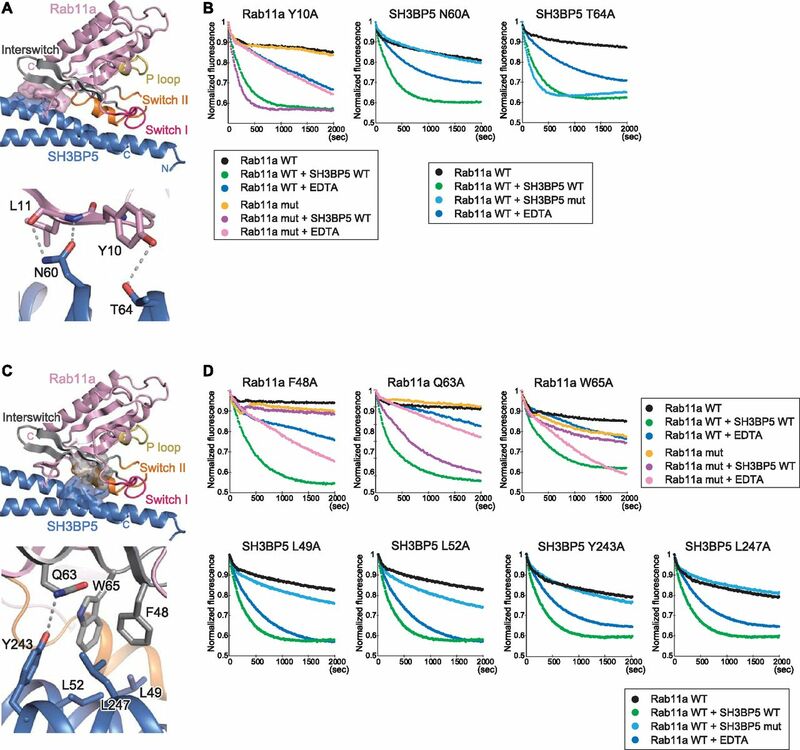 (A) Interactions of SH3BP5 with the N-terminal region of Rab11a. The coloring scheme is the same as that in Fig 2A. The interacting residues of SH3BP5 and Rab11a are shown as sticks (with translucent molecular surfaces in the top panel). The SH3BP5 residues interacting with Rab11a are shown as blue sticks with translucent molecular surface. The close-up view of the interactions is also shown in the bottom. Hydrogen bonds are indicated as dotted lines. (B) Guanine nucleotide exchange assays for Rab11a and SH3BP5 mutants that were designed to become defective in the interaction between SH3BP5 and the N-terminal region of Rab11a. The time courses of the Mant-GDP fluorescence are plotted for the indicated samples. One representative plot from three or more independent experiments is shown for each sample. (C) Interactions of SH3BP5 with the interswitch region of Rab11a. The presentation scheme is the same as that in (A). (D) Guanine nucleotide exchange assays for Rab11a and SH3BP5 mutants that were designed to become defective in the interaction between SH3BP5 and the interswitch region of Rab11a. The time courses of the Mant-GDP fluorescence are plotted for the indicated samples. One representative plot from three or more independent experiments is shown for each sample. Figure 4. 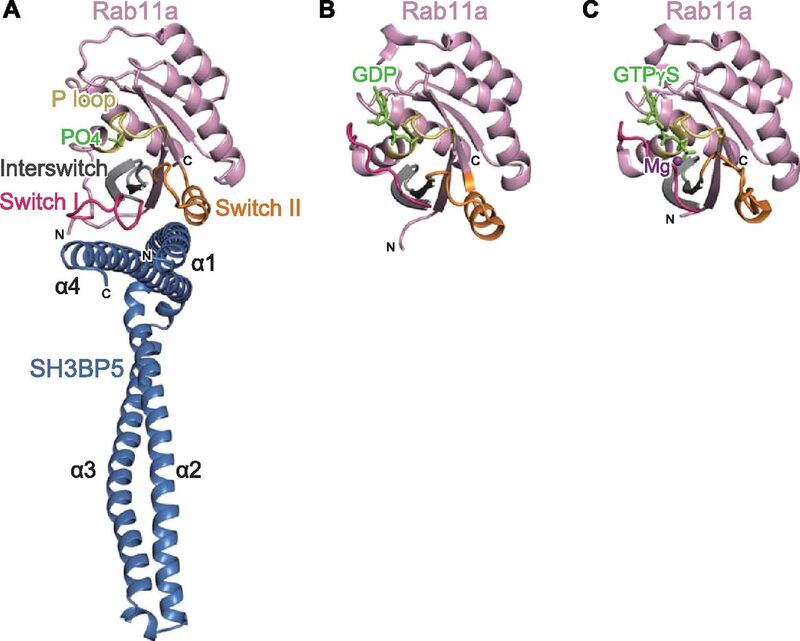 Interactions of SH3BP5 with the switch regions of Rab11a. 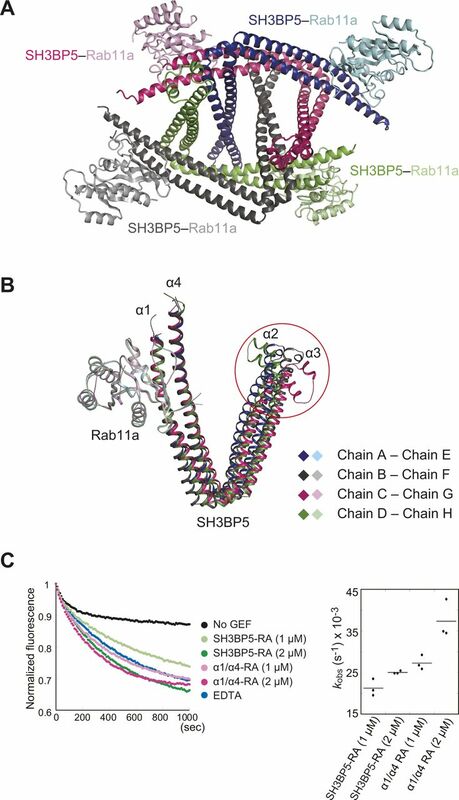 (A) Interactions of SH3BP5 with the switch I region of Rab11a. The presentation scheme is the same as that in Fig 2A. 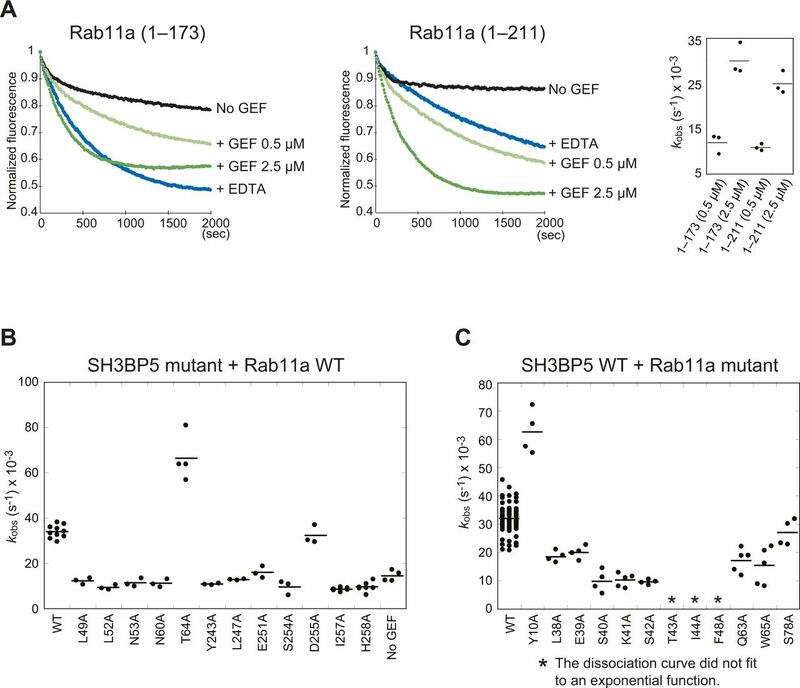 (B) Guanine nucleotide exchange assays for Rab11a and SH3BP5 mutants that were designed to become defective in the interaction between SH3BP5 and the switch I region of Rab11a. The time courses of the Mant-GDP fluorescence are plotted for the indicated samples. One representative plot from three or more independent experiments is shown for each sample. 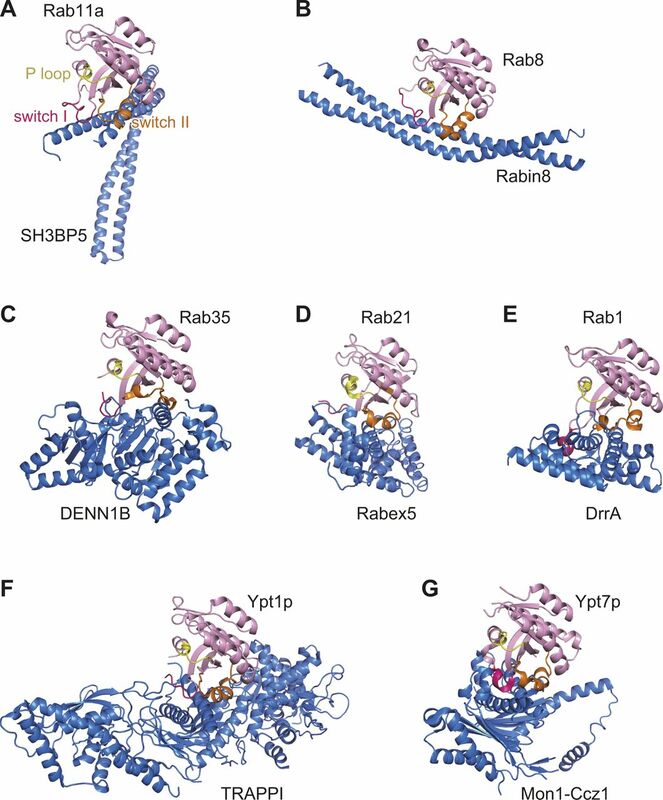 (C) Interactions of SH3BP5 with the switch II region of Rab11a. The presentation scheme is the same as that in (A). 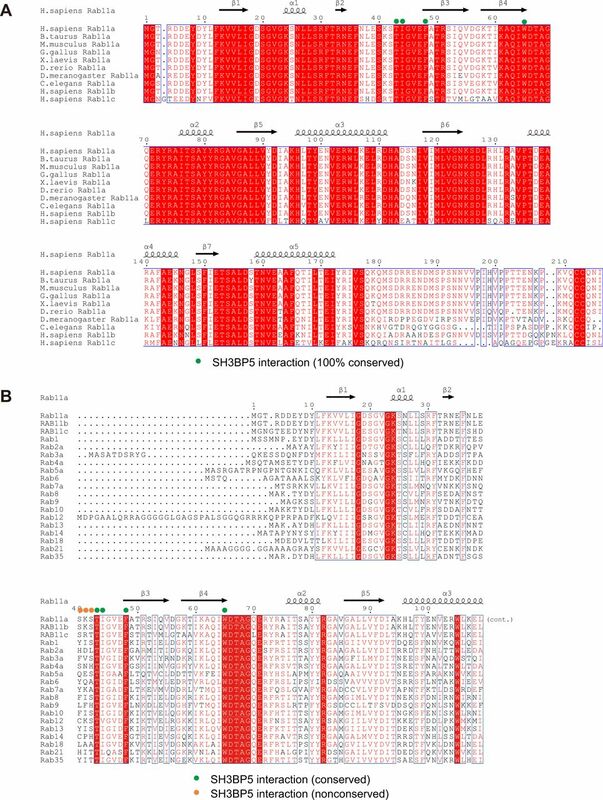 (D) Guanine nucleotide exchange assays for an SH3BP5 mutant that was designed to become defective in the interaction between SH3BP5 and the switch II region of Rab11a. The time courses of the Mant-GDP fluorescence are plotted for the indicated samples. One representative plot from three or more independent experiments is shown. Figure 5. 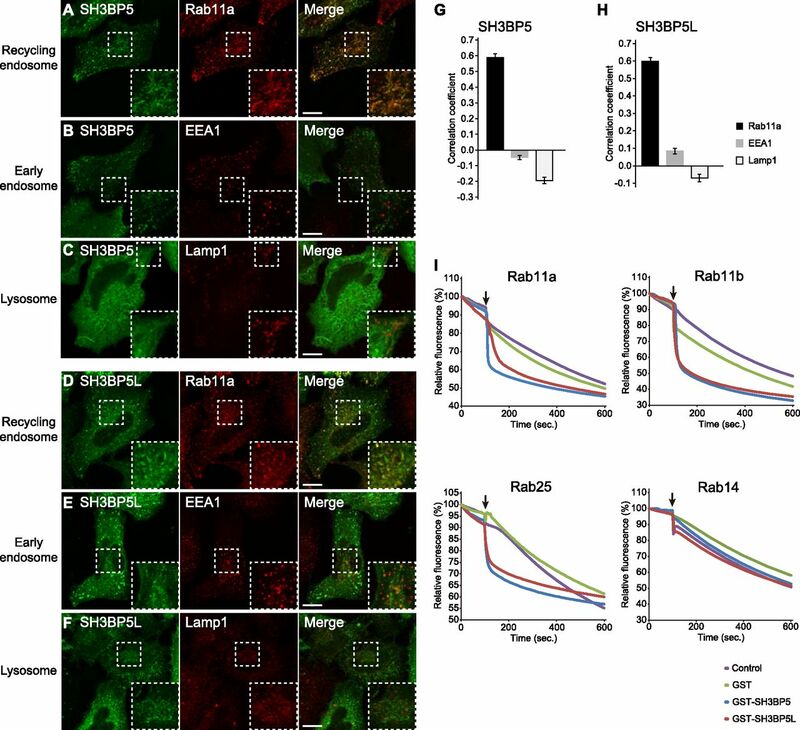 SH3BP5 and SH3BP5L localize to recycling endosomes and show GEF activity for Rab11 family proteins. (A–F) Subcellular localization of EGFP-SH3BP5 and EGFP-SH3BP5L in Hela cells. Hela cells, which transiently expressed EGFP-SH3BP5 or EGFP-SH3BP5L, were immunostained with anti-Rab11a (recycling endosome marker; A and D), EEA1 (early endosome marker; B and E), and Lamp1 (lysosome marker; C and F) as indicated. Scale bars indicate 10 μm. (G, H) Quantitative analysis of colocalization of GFP-SH3BP5 or GFP-SH3BP5L with organelle markers. Pearson's correlation for the colocalization of GFP-SH3BP5 or GFP-SH3BP5L with each organelle marker was calculated by coloc2 analysis performed with Fiji/ImageJ. The graph shows the average colocalization percentage per cell. Error bars represent the SEM (n = 42, 68, and 37 for Rab11, EEA1, and Lamp1 of EGFP-SH3BP5 expressed cells, respectively, and n = 52, 72, and 44 for Rab11, EEA1, and Lamp1 of EGFP-SH3BP5L expressed cells, respectively). (I) In vitro GEF assays of SH3BP5 and SH3BP5L for Rab11 family proteins. Mant-GDP release from human Rab11a, Rab11b, Rab25, and Rab14, which are Rab GTPases localized on recycling endosomes, were measured by adding GST-SH3BP5 or GST-SH3BP5L with liposome. Arrows indicate the time points when the hydrolysis-resistant GTP analog was added. One representative plot from two or more independent experiments is shown for each sample. Figure S5. 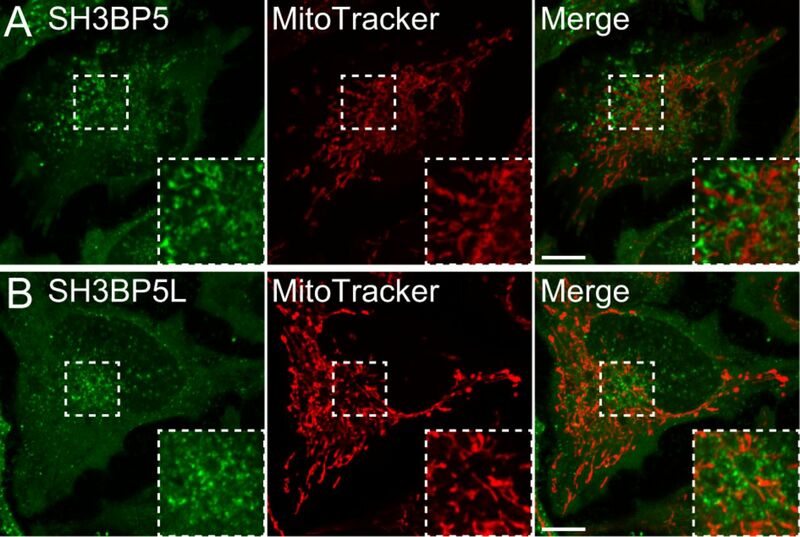 GFP-SH3BP5 or GFP-SH3BP5L do not mainly localize to mitochondria. (A, B) Hela cells, which transiently expressed (A) EGFP-SH3BP5 or (B) EGFP-SH3BP5L, were stained with MitoTracker Red CMXRos. Figure S6. 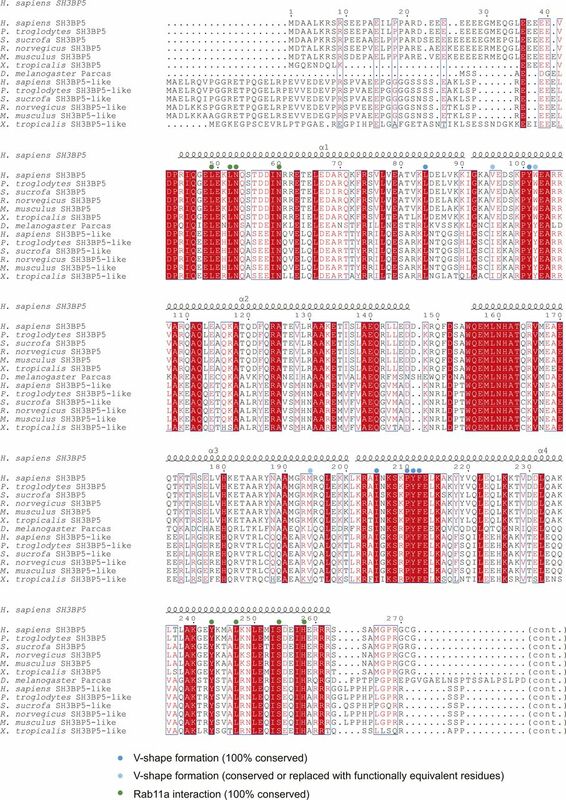 Sequence alignment of Rab family proteins. (A) Amino acid sequence alignment of Rab11a from representative metazoa, human Rab11b, and human Rab11c. (B) Amino acid sequence alignment of human Rab family proteins. Figure S7. Structures of Rab–RabGEF complexes. Rab proteins are colored in pink, except that switch I, switch II, and P loop are colored in red, orange, and yellow, respectively. GEF proteins are colored in blue.